And For Badges, ID Cards or Name Tags, Flash Lights and Small Meters. We provide 3 style of cell phone strings for a variety of application. CP-001 comes with small split rings, CP-001-LB comes with split rings and lobster claw hook, CP-002 come with detachable buckle. All custom length universal strings come with 13 color available, Black, Red, Navy Blue, Green, White, Royal Blue, Burgundy, Yellow, Pink, Teal, Grey, Purple and Orange colors. The flexible and durable strings can be used to hook up variety of small items, like charms, beads, decoration items, ID cards, name badges, cell phones, bartender's bottle cap openers, USB flash drives, flash lights, small meters, digital camera, perfume bottles, lipsticks, keys, displays and more. 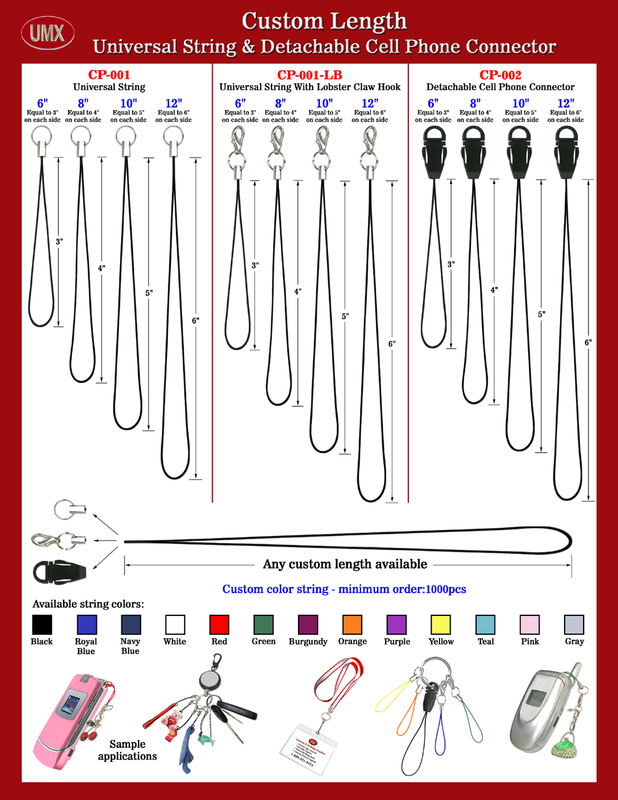 You are viewing Lanyards > Strap Supplies > Any Custom Length and Custom Color Universal Cell Phone Strings: For USB Drives, Cellular Phones, MP3, Small Meters, Charms, Beads.